Washington — While Senators were up all night on Capitol Hill during the “vote-a-rama” trying to repeal Obamacare, members of the House of Representatives competed instead on the tennis court. 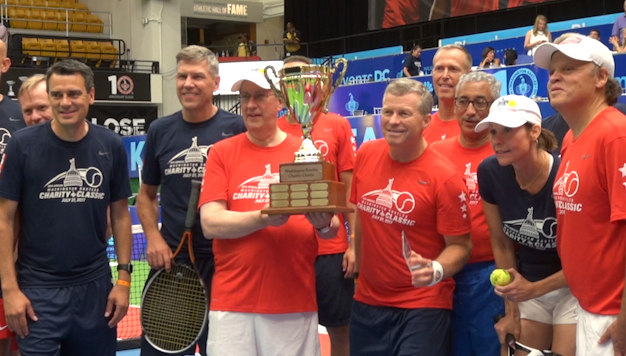 Republicans and Democrats came together for the 5th Annual Washington Kastles Charity Classic Thursday night at the Charles E. Smith Center. Divided into teams. Stars and Stripes, the tennis event brings members of Congress, the media and professional players together for a night of laughs and friendly competition. Players included Charlie Dent, R- Pa., Cheri Bustos, D-Il., Peter Alexander of NBC News and professional tennis player Bruno Soares. Senator Shelley Moore Capito, R-Wv., was scheduled to play but had to stay back at the Capitol for Senate healthcare voting. The Stars beat the Stripes 43-42 in seven sets. Jared Huffman, a California Democrat, said he enjoys congressional sports rivalries and also played in last month’s Congressional Baseball Game. The baseball game was marred by a shooting attack in which Steve Scalise, R-La., was seriously wounded during a practice before the event. Scalise is recovering and undergoing rehabilitation. While security was present, a Kastles spokesperson said there had been no undue concerns during the tennis event. The tennis classic raised about $30,000 for four charities, Friends & Family, TAPS, N Street Village and the DC Public Education Fund.